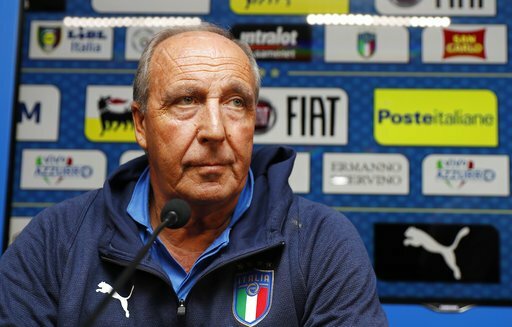 The head coach of the Italian football team Gian Piero Ventura has left following the failure of the team to make the World Cup for the first time in 60 years. The coach was widely criticized for his team selection and the tactics he employed throughout the qualification phase. AC Milan has announced that Croatian forward Nikola Kalinic has joined the Italian league side from Fiorentina on Tuesday on a loan with obligation to buy for a reported fee of €25 million. The Italian club have made a statement saying they signed Kalinic “on loan with an obligation to buy” but did not indicate how long the loan is slated to last. Chief executive Marco Fassone said his arrival had put finishing touches to the already reinvigorated squad. “He [Kalinic] is the player we wanted, because of his experiences and quality,” he said. “We’ve always talked about getting the right mix and this completes the backbone of the team alongside Leonardo Bonucci and Lucas Biglia. He completes the squad; we are happy and proud that he is a Milan player,” Marco added. AC Milan lacklustre performance last season has seen them spent over 190 million euros ($223 million) to ensure that they become title contenders this season in Italy’s Premier division (Serie A). Chelsea striker Diego Costa is set to join Serie A giant AC Milan this summer. The Spanish forward was deemed surplus to requirements by manager Antonio Conte despite helping the club to their second Premier League title in three years. The public spat between the former Atletico Madrid man and the former Italian football team manager affected the valuation of the forward as prospective employers know Chelsea are desperate to push him out. Serie A side AC Milan have signed over ten players as they rebuild their squad. Directors of the club were spotted in London to likely complete the deal for the player. The Rossoneriwant Costa to contribute as they seek to end Juventus’ long standing reign in the league. Juventus made history last Sunday as they became the first club to win the scudetto six times in a row. The Bianconeri clinched the record-breaking title on the penultimate match of the season as then swept aside relegation battling Crotone to wade off any interest title rivals Roma might have had after beating Chievo in an eight-goal thriller that ended 3-5 in Roma’s favour. 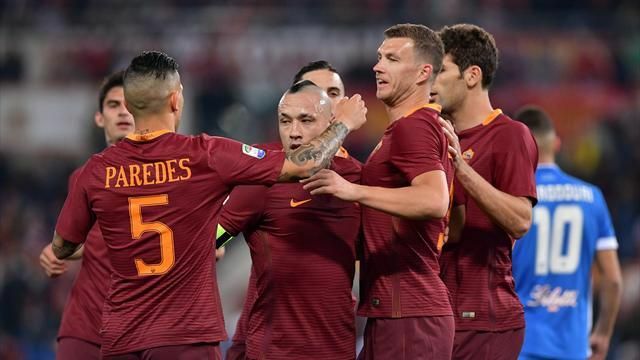 The Giallorossi stalled the celebrations and also reopened the title race when they beat Massimiliano Allegri’s men last week as the Old Lady put in a surprising listless performance. Next stop is June 3rd’s champions League date with Spanish side Real Madrid as they hope to top the domestic cake with a continental cherry – a thing they have been trying to achieve since their domestic dominance started six years ago and has led to two appearances in the Champions League finals but never to the title itself. Roma striker EdinDzeko has broken the club’s record for number of goals scored in a season. The former Manchester City striker hit both goals in the 2-0 rout of Empoli at the StadioOlympico. Dzeko has a total of 33 goals in all competitions this termwith 23 coming in Serie A games. The record of 32 goals a season was held by club legend Francesco Totti, Rodolfo Volk and Pedro Manfredinibefore Dzeko broke the mark. He scored the first goal using his knee following a corner kick in the 12th minute. He grabbed the brace in the second half after Mohammed Salah sent the ball. Real Madrid’s star player, Cristiano Ronaldo, was hailed by former defender of same club, Michel Salgado for his (Ronaldo) fourth Ballon d’Or win. Salgado emphasized that the Portuguese’s successes are interestingly impressive considering who he has been up against. Salgado believes that its highly impressive for the Real Madrid star to have won the Ballon d’Or four times against the argentine star, Lionel Messi. Salgado also appreciated the team manager, Zinedine Zidane and the team as a whole for their efforts so far in the chase for the Spanish league title. Real Madrid is having a perfect season so far and he thinks the current Real Madrid is more consistent than the one he played with. Former Inter Milan player Luisito Suarez believes that the club needs some stability at the top if they want to become a dominant force once again in Italian football. Luisito Suarez has been a star player for Inter Milan in the sixties and has won three league titles and two European Cups with the club. He said that this is a problem that is faced by football clubs in general at the moment and that Inter Milan will have to find a solution to this. He said that managers do barely have time to mount a serious project and that they are replaced too soon without having time to build a team. Massimiliano Allegri says that he is expecting a tough test from AC Milan as Juventus head into the game looking to maintain their winning run. Even after having won several consecutive league titles, Juventus remain as the strong favourite for the 2016-17 league title. A game against Milan would probably rank as one of the easiest in the Juventus fixture list, as AC Milan have never really threatened against the top teams in the last couple of years. Financial difficulties, though, meant that the club finally changed ownership from Silvio Berlusconi to Chinese investors. Juventus manager Massimiliano Allegri claimed that he is feeling confident about the title chances of his team in the 2016-17 season. The five-time consecutive Italian champions started their defence of the title with a 2-1 win over Fiorentina. This victory was especially important since the club was entering into a new era. They were without midfielder Paul Pogba, who has been instrumental in the last four title successes. The midfielder was sold for a world record transfer fee of £ 89 million and the club spent most of this fee in bringing Napoli striker Gonzalo Higuain. The Argentine striker showed why he is one of the highly rated forwards in world football. It took him just 75 minutes to open the account for his new club. A proven striker in Italian football, Higuain’s presence is only expected to make Juventus stronger even though they will be without Pogba. Allegri stated that every team’s ambition is to win all the games. Hence, he is prepared to wait until the end of the season to find out the real winner. He is confident about his team’s ability to retain the title since they have signed are some of the best players in the world. Different teams are doing different things as the heat turns up in the Euro tournament. AC Milan on their side is planning their game a little different. They are planning to restructure their gaming plan. It is felt by their new coach, Vincenzo Montella that the team needs to restructure their defensive strategies. His current focus is to devise a new line up for the team and rebuild it from scratch. Rossoneri has lacked a significant leadership for long. That has shown in the past seasons as well. This is a problem that has plagued them as they have sought to find their position in the European competition. The new man at the helm is looking to turn things around and to make things better.